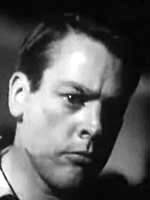 Kevin McCarthy starred in the 1956 film Invasion of the Body Snatchers. 03/14/1974 0057 The Fall of the House of Usher The evergreen horror tale by Edgar Allan Poe tells the story of a heir driven insane by the ancient house of Usher, which he believes to be sentient. The ultimate macabre phantasmagoria winds with him burying his cataleptic sister alive. 06/18/1974 0107 Dr. Jekyll and Mr. Hyde An unforeseen accident gives birth to the evil alter ego of the doctor in charge of the experiment. 07/18/1974 0120 The Dream Woman Convinced that a woman he met at the local bar is his soul mate, a man abandons his faithful and loyal wife in order to pursue her. He is soon plagued by visions of his death at his new lover's hands. 05/07/1975 0269 The Transformation A young man wastes both his inherited fortune and the love of a beautiful woman. He finally makes a deal for three days inside his beautiful body with a demon from underground. But the demon does not keep his deal and he must search for his body. He ends up finding way more. 05/23/1975 0279 Markheim: Man or Monster? Karl Markheim is the ultimate anti-hero as he manipulates and swindles everyone around him to get his ends. He is left out from the will of his rich uncle and decides to torture his wife and her father for money, blithely unaware of the strange figure who witnesses all from behind a mirror. 07/16/1975 0309 Goodbye, Karl Erich After taking in a shell-shocked casualty of war, a German doctor teaches the young orphan to speak again and face the horrors he experienced during World War I head on. The boy soon becomes confident and grows up to be a Nazi terrorist. 01/08/1976 0411 A Connecticut Yankee in King Arthur's Court In an attempt to free himself, a Nineteenth Century factory owner exploits his knowledge of history when he wakes up from a fight in Camelot and finds himself placed under arrest by none other than the legendary King Arthur. 04/19/1976 0470 Murder Most Foul In this Shakespearean drama of arrogance and blind ambition, a nobleman falls victim to a chilling prophecy. 04/25/1976 0476 The Serpent of the Nile A classic rendition of Shakespeare\'s \"Anthony and Cleopatra.\" It tells of their tempestuous relationship and equally tragic death. 03/01/1977 0609 The Hound of the Baskervilles In this classic tale of mystery and terror, the notorious sleuthing duo of Sherlock Holmes and Dr. Watson investigate the disappearance of a young lady, and its connection to the legend of a ghostly hound said to haunt the moors surrounding the Baskerville estate. 03/08/1977 0613 The Sign of Four This classic tale of theft and betrayal hurtles the legendary Sherlock Holmes into the midst of a secret society. The terrible secrets continue to plague and haunt its members long after their pact is broken. 03/25/1977 0623 A Study in Scarlet A sealed room mystery that launched the careers of the legendary Sherlock Holmes and Dr. Watson. A strange death, a valuable engagement ring and the word RACHE scrawled in blood send the brilliant Holmes and Watson hot on the trail of a wily and sinister murderer. 04/26/1977 0641 The Adventure of the Red-Headed League Sherlock Holmes helps a friend who has been swindled by a group of red-headed men. He uncovers a much larger scheme. 05/31/1977 0657 The Boscombe Pool Mystery Sherlock Holmes solves the murder mystery of a young man who is accused of murdering his father. The evidence seems irrefutable, but Holmes dissects it. 06/28/1977 0673 The Adventure of the Speckled Band Sherlock Holmes is hired by a young heiress to find out who killed her sister in a sealed room murder. 07/11/1977 0680 A Scandal in Bohemia The king of a Bohemian nation employs Sherlock Holmes to retrieve a scandulous photo from an old fling. Holmes finally meets his match in cunning and deduction. 07/25/1977 0688 The Adventure of the Blue Carbuncle The gift of a Christmas goose with a valuable jewel inside and an old hat send Sherlock Holmes and Dr. Watson on the hunt for the goose's owner. 10/07/1977 0721 The Adventure of the Beryl Coronet The classic Sherlock Holmes tale of a financier father apparently apprehending his son while trying to steal valuable gems from an ancient crown left in his care. Holmes is asked to obtain a confession but he finally solves the mystery from the silence of a suspect. 11/14/1977 0740 The Gloria Scott The evergreen Sherlock Holmes tale of unravelling a case around a mutiny aboard the ship Gloria Scott with the help of a coded message from one of its survivors. 01/24/1978 0770 The Ranee of Rajputana A small copper figurine of the Indian queen of thieves traps an deceitful and mischievous stockbroker into a dangerous but prosperous career as a robber and then tries to get him to commit a murder. When he tries to step back, his good fortune evaporates and an investor asks for her money back. But she aid him in executing another crime that might cover all his previous misdemeanours. 06/23/1978 0854 The Black Door A 21 year old man is made to stay in an ancient mansion in order to procure his inheritance. The key apparently is behind a strange black door on the topmost floor. 09/01/1978 0887 Flash Point A photographer has an assignment at a steel mill but starts a passionate affair with the wife of a worker at the factory. Problems arise when that worker accompanies him on a tour of the factory. 06/20/1979 0990 The Spaces on the Wall An art broker hires a private investigator to look into the case of an associate that fell victim to vicious a scam. 03/26/1980 1071 Conspiracy A classic narration of the secret plot to assassinate Abraham Lincoln and his cabinet by conspirators John Wilkes Booth and his pack of ragtag followers. 07/14/1980 1102 Nightmare in Gillette Castle When a couple on tour visit the home of the biggest actor to portray the legendary Sherlock Holmes on the big screen, they are unexpectedly forced to spend the night in the castle. They soon find that they have become part of a crime scene with the real Sherlock Holmes leading the investigation! I always looked forward to McCarthy's turns as the Great Detective .... totally agree with earlier commentor. I don't think anyone ever played Sherlock Holmes better than did Kevin McCarthy including Basil Rathbone!!!!!! My brother met McCarthy in the Atlanta airport back in the '80s and still talks about how nice and kind he was. Rick didn't want to bother him, so he confirmed the actor's identity by speaking to his wife when McCarthy went to the snack bar. "Oh, he loves being recognized!," she said, "Ask him for his autograph!" Rick waited until the man had eaten, then walked back over to where he and his wife were seated, and McCarthy smiled up at him while he approached, and treated him beautifully. If only all celebrities were like that! I grew up listening every night. I have tried to get my little ones to listen. They just tell me that they are too scary. I enjoy McCarthy's take on the character of Sherlock Holmes. He gives a sharp, crisp performance imbued with instances of warm sympathy towards the people he is helping, a characteristic I've never seen or heard in any other actors' performances. Though no one compares to Basil Rathbone as Sherlock Holmes, Kevin McCarthy fills the role very well on Radio Mystery Theater. Why does he look so angry in this photograph? Is he mad? Rathbone --stalwart talent of course--yet his turn as Holmes in the audio series is not the one I re-listen to with ever all that very much eagerness. He's almost too flawless; too practiced; too much always the same Rathbone. Rathbone was Rathbone in seemingly any role he ever did. Much, much richer and more evocative are the outings by Sir John Gielgud and yes, also this series featuring Kevin McCarthy. What a treat to see this fine performer shine like this, on his own, not as second-fiddle to any other star, as so often happened. But why Gielgud or McCarthy over Rathbone? Credit is perhaps due the more polished productions furnished to these men--they had a less demanding pace at just 16 episodes for Gieldgud and 10 for McCarthy. Whereas Rathbone and Bruce were cranking out their roles every week in addition to the movie series. Nevertheless the range and timber of the Gielgud delivery and McCarthy too; are astonishing. Their phrasing and delivery offer a world of insight that Rathbone never had time or license to plumb. McCarthy in particular is such a surprise. His voice is not English; but his tone is so refined and buttery that one swiftly overlooks this. It's an extremely intelligent voice and yes--one which has notes of warmth in it where we never expect any; not from anyone playing Holmes. McCarthy's Holmes is one whom we must infer likes his fellow humans. Gielgud too, provides this in his banter with Watson (none other than Sir Ralph Richardson). But yes, McCarthy is certainly special. I wish I'd had a chance to meet him. I was never a fan of the Sherlock Holmes movies, but I looked forward to the Mystery Theater versions. I listened to these faithfully every night at 10:07 pm.